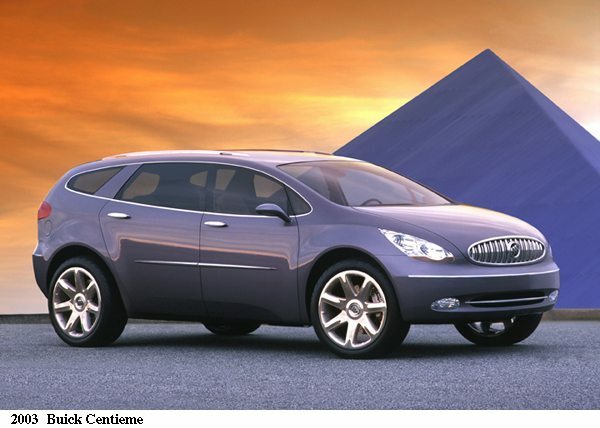 The Buick Centieme concept is a distinctive, luxurious vehicle that combines the best features of a sedan and sport utility vehicle. Commemorating Buick’s 100th anniversary, the progressive design suggests a rolling piece of sculpture, embodying the romance of travel for which Buick is renowned. The four-door Centieme seats six passengers in a three-row, dual seat configuration. The low, wide-stance vehicle sports Buick’s graceful flowing signature lines and classic grille. Combined with a relatively long wheelbase and tight overhangs, Centieme’s form also projects a nimble and energetic appearance. A 3.6-liter, twin-turbocharged V-6 engine – good for 400 horsepower and 400 lbs.-ft. of torque – complements the spirited design. It is mated to a Hydra-Matic 4T65-E electronically controlled four-speed automatic transaxle with General Motors’ Versatrak all-wheel-drive system. The front end uses a strut configuration, while the rear employs an SLA independent suspension with coils for car-like performance and handling. Built by famed Italian design house Bertone, the Centieme rides on 22-inch front and rear aluminum wheels with Michelin tires. Interior is both luxury and technology. Inside, “captain’s chair” seating in the front and middle rows give the spacious cabin a look of comfort and security. Armrests are located on the adjacent doors and integrated in the seats for perfect symmetry and enhanced comfort. The front and middle-row seats power-adjust in six ways for individualized coziness. The middle seats also slide forward for easy access to the power-folding, flat-load third row. Ease of entry and egress for rear passengers is aided by wide-opening rear doors. The center consoles for the front and middle seats are service areas that also slide forward on tracks submerged in the flat floor for extra utility. Technology is advanced but understated, such as with the steering-wheel-mounted electronic shift controls. The back panels of the front seats also incorporate DVD entertainment centers for rear occupants.